SMART, the country’s Leading mobile services provider, unveils its unbeatable offers for the much-anticipated Samsung Galaxy Note 7. Beginning today, August 6, pre-registration links are up for both Smart Postpaid and Smart Infinity. For Postpaid, Smart offers the Samsung Galaxy Note 7 at Surf Plus Plan 999, with a monthly cash-out of P1,200 for 24 months, for a total of just P2,199 a month. 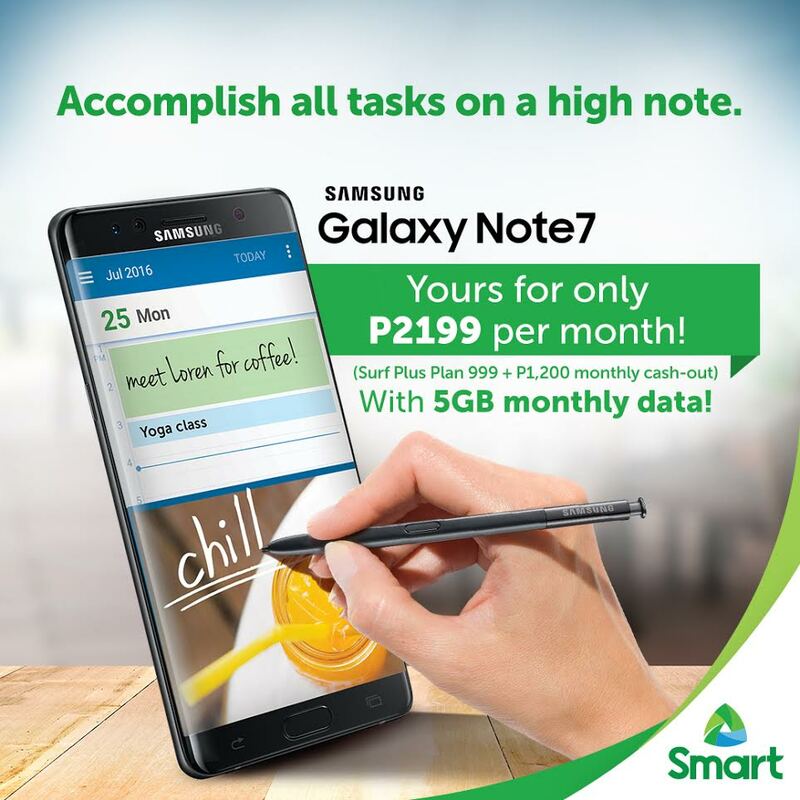 With Surf Plus Plan 999, subscribers can enjoy the new Samsung Galaxy Note 7 with supersized 5GB data for all their surfing needs, 30 call minutes and 100 texts to all networks, plus free data access for the app of their choice every month—be it Facebook, Instagram, Twitter and YouTube, among many others. Approved postpaid pre-orders from August 6 to 19 will also receive a free Samsung battery pack and clear case. This is for the following Smart Wireless and Business Centers: SM Megamall, Rockwell Powerplant Mall, SM Aura, SM North EDSA, SM Baguio, SM Clark, Festival Mall, Molito, SM Cebu, SM Davao, and the Smart Online Store. Those who pre-order and get their applications approved via the Smart Online Store can get their Note 7 units as early as August 17. For Smart Infinity, two Galaxy Note 7 devices may be enjoyed with the Roaming Plan 8000 (24 months) or a Galaxy Note 7 and a Galaxy S7 for the Roaming Plan 5000 (30 months). Members may experience their new devices with discounted outbound roaming rates, 15GB data allocation and a hefty monthly consumable allocation. New Plan 5000 and Plan 8000 members from August 6 to Aug 19 will also receive a complimentary Level Box Pro speaker. To know more about Smart Infinity’s exclusive offers, existing members may contact their Infinity Relationship Officer or the Infinity dedicated hotline *800. For new membership, call 848 8806. 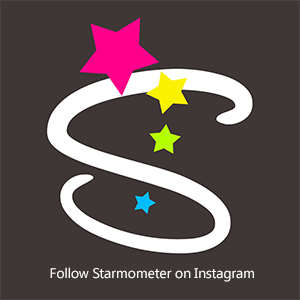 “Smart Infinity ensures our members enjoy the latest gadgets and fast mobile data that they deserve. 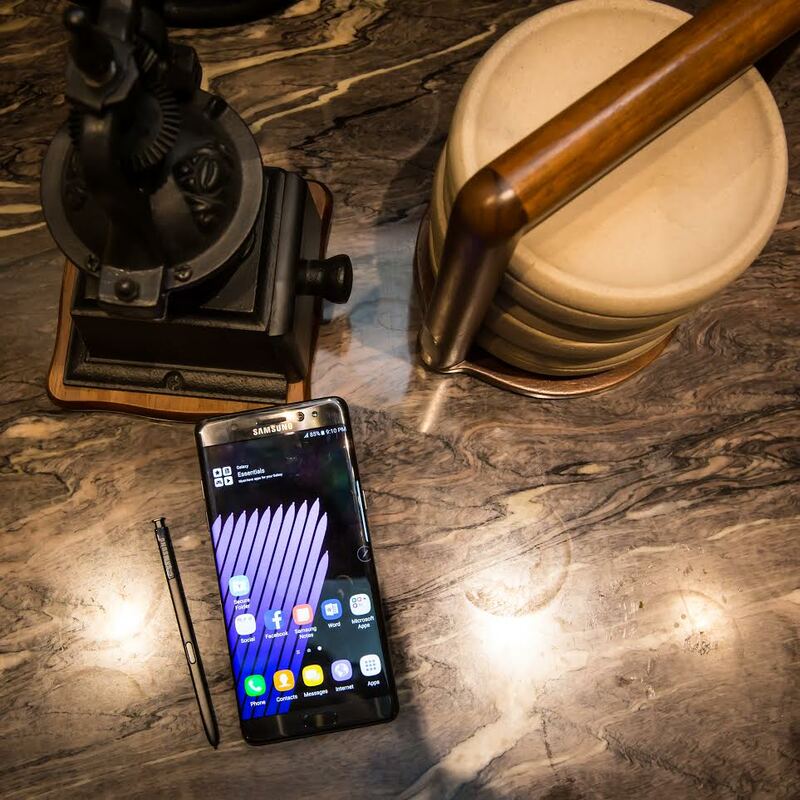 The Galaxy Note 7 coupled with Smart’s ultra-fast LTE technology is definitely a worthy addition to our line-up,” said Julie C. Carceller, Head of Smart Infinity. Smart’s announcement followed Samsung’s simultaneous launch events for Unpacked 2016 in New York , Rio de Janiero and London on Aug. 2, with new groundbreaking features that push the boundaries of mobile productivity and security. 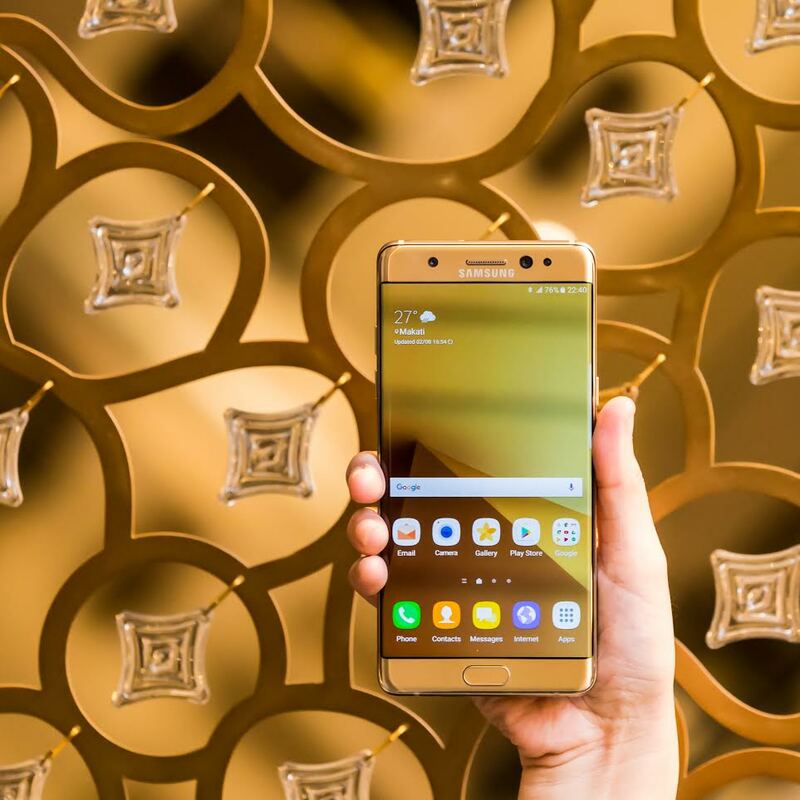 “Like Smart’s thrust towards breaking barriers, the Samsung Galaxy Note 7 shatters the limits of smartphone technology with its newest features. We are very excited to welcome the Samsung’s latest flagship to our portfolio and offer it to subscribers with our supersized data plans,” said Kathy C. Carag, Smart Mobile Business Head. “Time and again, Samsung has surprised us with stylish innovations in its Galaxy Note series, which allows users to be more creative and productive with an easy swipe of a finger or a slide of the S-Pen. We can’t wait to see and experience the groundbreaking features in this latest device, which subscribers can surely optimize especially now that we are beefing up our LTE network across the country,” she added. Galaxy Note 7 carries the latest innovation—the first ever Iris scanner for added security, alongside the enhanced S-Pen with higher precision and responsiveness. Note 7 is also the world’s first mobile HDR video that can take footage in sharper colors and with high dynamic range. It also carries superior DSLR like Real Pixel Camera with the first ever dual photodiode sensor (2PD) in mobile, providing superfast autofocus and brighter and clearer images with f/1.7 lens that is excellent for low light. It is water and dust resistant, has an expandable memory up to 256GB and runs on an Octa-core processor for smoother graphics. Be among the first to own Note 7, visit smart.com.ph/note7 or smart.com.ph/infinity/samsungnote7 to register. iPhone 6 and iPhone 6 Plus, Now Available from the Biggest Network! Get Premium Access on iWantTV with #SmartGigaSurf 50! Pay Your Smart Postpaid Bill Early for a Chance to Win Gadgets! P2199 for 24 months = 52,776 with only 5GB per month. nice Smart.